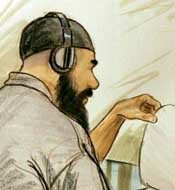 A hearing is held for Guantanamo detainee Salim Ahmed Hamdan, who is being accused of being a member of al-Qaeda, conspiring to commit acts of terrorism, and destruction of property. The five-member military commission—the first to conduct a trial since World War II—is presided over by Army Col. Peter Brownback, who, according to the Pentagon, has 22 years of experience as a judge advocate and almost 10 as a military judge. [BBC, 6/29/2004; Los Angeles Times, 8/25/2004] Hamdan’s military lawyer, Navy Lt. Cmdr. Charles Swift, begins his argument with an attack on Brownback’s qualification to practice law. He calls attention to the fact that Bownback, a retired military judge, is not a current member of the bar in his home state of Virginia. He also alleges that the judge’s office had inappropriate out-of-court discussions with the Office of Military Commissions, and that Brownback had said in a meeting with defense lawyers that a speedy trial was “not an issue here.” Though Brownback denies making the comment, Swift produces a recording of the conversation. But Bownback isn’t the only one put on trial by Swift. He also targets three members of the commission and an alternate member. Swift argues that three have “extensive backgrounds” in dealing with operations in Afghanistan, the treatment of detainees, and military intelligence, and therefore are not in a position to pass an unbiased judgment on the defendant. The alternate member, Lt. Col. Curt S. Cooper, Swift demonstrates, knows little about international law. When asked, “Do you know what the Geneva Convention is, sir?” Cooper replies: “Not specifically. No, Sir. And that’s being honest.” But, he adds, he knows that the Convention consists of three articles. But as Swift points out, that is wrong. “Actually, there are six, Sir,” Swift says, correcting him. Air Force Col. Christopher C. Bogden is the only commission member not challenged by Swift. [Los Angeles Times, 8/25/2004; New York Times, 8/25/2004] In addition to his attacks on the commission members, Swift challenges the merits of the charges against his client. For example he argues that Hamden was denied a speedy trial and that the laws he has been accused of violating were written after the alleged offense. Hardline Conservative Justices Dissent - Stevens is joined by Justices David Souter, Stephen Breyer, and Ruth Bader Ginsburg. Justice Anthony Kennedy issues a concurring opinion. Dissenting are Justices Samuel Alito, Antonin Scalia, and Clarence Thomas. Thomas, in a dissent signed by Scalia and Alito, calls the decision “untenable” and “dangerous.” Chief Justice John Roberts recused himself from the case because of his participation in a federal appeals court that ruled in favor of the administration (see November 8, 2004). Navy Lieutenant Commander Brian Mizer, the lawyer for Guantanamo detainee Salim Hamdan, says that senior Pentagon officials are orchestrating war crimes prosecutions for the 2008 presidential campaign. In a court brief filed on this day, Mizer describes a September 29, 2006 meeting at the Pentagon where Deputy Defense Secretary Gordon England asked lawyers to consider 9/11-related prosecutions in light of the upcoming presidential campaign. “We need to think about charging some of the high-value detainees because there could be strategic political value to charging some of these detainees before the election,” England is quoted as saying (see September 29, 2006). Pentagon spokesman Bryan Whitman refuses to discuss specifics of the case, but says that the Pentagon “has always been extraordinarily careful to guard against any unlawful command influence” in upcoming military commissions trials. Mizer says that because of England’s instructions, and other examples of alleged political interference, his client cannot get a fair trial. Three weeks before England’s observation about the “strategic political value” of the trials, President Bush disclosed that he had ordered the CIA to transfer “high-value detainees” from years of secret custody to Guantanamo for trial. Issues 'Scrambled' - Attorney Eugene Fidell, president of the National Institute of Military Justice, says the Hamdan motion exposes the problem of Pentagon appointees’ supervisory relationship to the war court. “It scrambles relationships that ought to be kept clear,” he says. England’s statement, says Fidell, is “enough that you’d want to hold an evidentiary hearing about it, with live witnesses. It does strike me as disturbing for there to be even a whiff of political considerations in what should be a quasi-judicial determination.” Susan Crawford is the White House-appointed supervisor for the court proceedings; England is a two-term White House appointee who has supervised the prison camps’ administrative processes. Crawford, England, and other White House officials have crossed the legal barriers that separate various functions of a military court, Mizer argues. Mizer plans to call the former chief prosecutor for the Guantanamo trials, Morris Davis (see October 4, 2007), who first brought the England remark to light. Davis resigned his position after contending that political influence was interfering with the proper legal procedures surrounding the prosecution of accused war criminals.